Even though internal sources are outperforming external ones when it comes to corporate hiring, more HR professionals are relying on external recruitment to fulfill their vacancies. This was one of the key findings of a new report by SilkRoad, which analysed more than 13 million applications, 600,000 interviews and 300,000 hires. It highlighted external sources deliver the majority of interviews (58%), compared to internal sources (42%). Despite this, internal sources produced the majority of hires (58%), compared to external sources (42%). Notably, external sources account for a slightly increased share of both interviews and hires this year—roughly 3% in both categories—compared to findings in last year’s report. “Many industry analysts predicted that talent acquisition spending would be up this year as companies struggled to recruit and retain people, so perhaps HR organisations spent more on external sources,” the survey stated. Among internal sources though, the survey found employee referrals were the most effective, producing 40% of interviews and 37% of hires. “Findings also showed that current employees are a common source of hires—and an essential part of the talent pool: Companies may be hiring internally to reduce the cost of hiring from the outside, increase the time-to-productivity, and decrease employee turnover,” the survey stated. 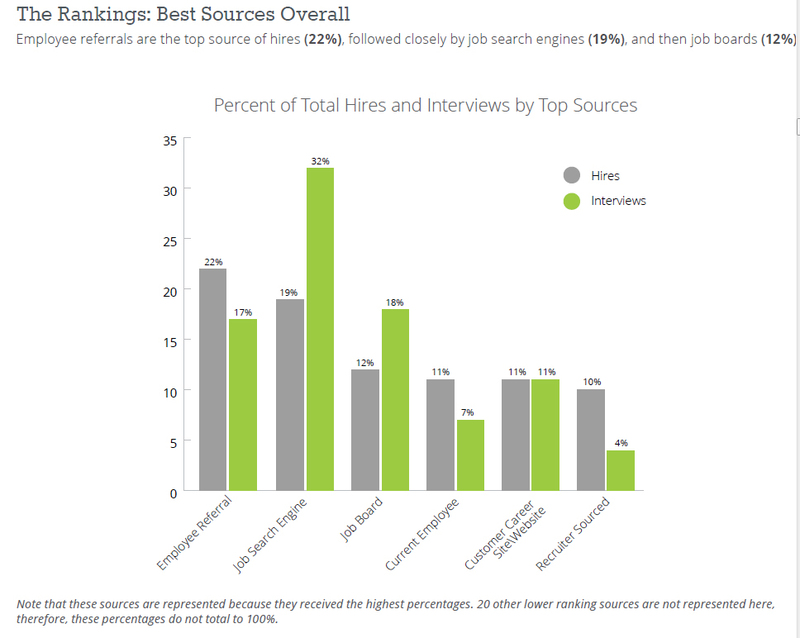 Employee referrals were, in fact, also found to be the top source of hires overall (22%), followed closely by job search engines (19%), and then job boards (12%). “One reason employee referrals dominate might be the strength a personal reference receives in the hiring decision. Employers often perceive that employees clearly understand the company culture and organisation, so referred candidates are seen as ‘best fit’ and are hired more rapidly. Referred candidates might also hear quickly from colleagues when jobs open, so they are interviewed earlier,” the report stated. Citing another industry study, the report showed that previously, almost half of HR professionals surveyed said their organisation had a previous policy against rehiring former employees. Now, however, 76% claimed they are more accepting of bringing back boomerang employees than they were in the past. “Our year-over-year calculations showed that former employees increased 16% as a source of hires, compared to last year,” the report stated.